Showers do not tend to break down at convenient times. What happens when your shower needs maintenance beyond your own capabilities in the middle of the night? No need to panic. You can call our 24/7 New York City plumbers to help you out. At Star Cities Plumbing, we conveniently offer round the clock service when your shower repair needs are not so timely. Sometimes it’s tough to determine what you can do yourself and when you need to get help from an experienced plumber. Here are a few scenarios that require shower repair beyond what you can manage with your own time and tools. 1. Shower valve replacement – Since the options are vast and overwhelming, a plumber can help you pick the best replacement selection for your shower. Installing the new valve takes precision and soldering skills, and a professional will know how to execute the task without inflicting damage to the shower walls. 2. Clogged drains – This is one where you probably want to try removing the clog yourself first. If you can’t, then refrain from using a caustic drain opener. It may sound like a good idea, but you can end up severely damaging the pipes. 3. Leaky faucet – Again, sometimes this problem can be easily resolved without the help of a plumber. However, don’t let a seemingly insignificant problem fool you. Simple leaks, if not quickly resolved, can lead to gallons of water loss and therefore a significant waste of your money. Call a plumber as soon as possible if you cannot resolve the problem yourself. When in doubt, go with professional help. It is better to receive help from our trained plumbers at Star Cities Plumbing than to end up making the situation worse when you try to perform a shower repair yourself. Contact us at 800-547-1422 for professional assistance. One of the great appeals of living in any of the five boroughs is the presence of the many historic sites that are readily accessible at a moment’s notice. Unfortunately, some of us have to deal with plumbing issues that arise due to the use of historic New York City plumbing equipment that is no longer functioning properly. 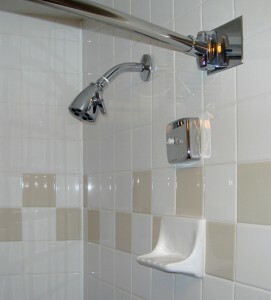 One of the most common questions we receive here at Star Cities Plumbing relates to how to fix leaky showercomponents. For the most part, a leaky shower is an easy fix, but if you are unsure about performing this repair, you should always seek out the help of a professional. Before you remove anything, it is best to first turn the handle as far as it can go in the “off” position. If the leak persists, it may be due to the handle. When you begin your repair, make sure that the water valve is turned off. You will then need to remove the handle and also the cartridge. Bring the old cartridge to a hardware store to ensure that you select the proper replacement. After you have replaced the cartridge and reattached the handle, check to see if the leak is still present. If it is, it may be time to fix the shower faucet. Again, the water should be turned off in advance of any repair attempt. Remove the faucet using a wrench or a pair of pliers. Once removed, inspect the faucet for any damage, as you may only need to replace the rubber gasket. If this does not solve the issue, then it may be time to call in a professional to show you how to fix leaky shower faucets or other components in person and by example. If your shower leaks persist after a repair attempt, or if you are simply uncomfortable with repairing the leak yourself, please feel free to contact us at Star Cities Plumbing at 800-547-1422.